What is Phantom Pain and How Can it Be Treated? Amputees face many challenges in day-to-day life, including experiencing phantom pain. Phantom pain, also referred to as phantom limb pain, is a common feeling that occurs in amputees where they feel pain in the limb they no longer have. The pain can range from a minor ache, as if the limb has fallen asleep, to a more-irritating burning feeling to an excruciating stabbing sensation. Not all amputees have phantom pain, and it’s more common in amputations involving legs and arms (versus other body part) and often seems to be coming from the part of the limb that would be farthest from the body, such as in the foot after a lower-extremity amputation. Pain prior to amputation: There have been a few studies conducted that have looked into why phantom pain is common in patients who had pain in their limb prior to their amputation – researchers believe that the brain holds a particular memory of the pain and will continue to send pain signals throughout the body, with or without the limb actually being there. Stump pain: In many cases, those who suffer from phantom limb pain also experience pain around the area of their amputation. Usually, stump pain occurs if there is nerve damage from the incision or if an abnormal growth develops. Neuromas (nerve endings that have been damaged) are, unfortunately, common in amputees. Prosthetics that fit incorrectly: Finding a prosthetic that conforms to your particular body correctly can be a challenge that requires ample patience and trial and error, but it’s a very important part of recovery after undergoing an amputation. An ill-fitting artificial limb can cause patients to feel pinching, soreness, and irritation which could evolve into phantom pain. Having a prosthetic that fits correctly has the potential to increase the quality of your life in many ways, which is why we at Beacon Prosthetics & Orthotics are committed to using the latest technology to ensure each patient has the best-fitting prosthetic possible and offer a wide range of prosthetics to serve every need. Be sure to talk to your doctor or your prosthetist if you are experiencing issues with your artificial limb. For quite some time, phantom pain was considered a phenomenon that was psychosomatic, meaning that the symptoms of pain were derived subconsciously through heightened levels of stress and anxiety. While researchers still do not know the exact cause of phantom limb pain, they have discovered that the symptoms are not a psychological issue at all, but rather a response that comes directly from the spinal cord and the brain – since the idea of a missing limb is not standard for the human body, the brain almost gets confused due to not receiving signals from the missing body part and provides its basic response to something that’s not “right”: Pain. Phantom pain most often occurs right after surgery – for some amputees, the condition goes away on its own but for others it is an ongoing situation. Getting treatment as soon as possible after the pain starts can be instrumental in limiting the residual effects. Additionally, a popular treatment amongst amputees with phantom limb pain is Mirror Box Therapy. With this course of treatment, the patient hides the affected limb behind the mirror while putting the remaining limb in front of the mirror to create the illusion that the missing limb is actually there. Then, the patient moves the existing limb around while watching its reflection in the mirror, essentially tricking their brain into thinking there are two functioning limbs that move without pain. Adjusting to living life with one less limb is difficult enough without the potential of dealing with agonizing pain that results from this condition. Luckily, there are ways to manage and, over time, hopefully eradicate this debilitating pain to keep living your most normal life possible. 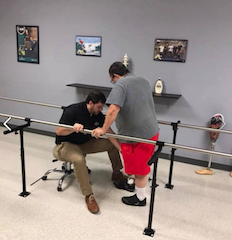 Beacon Prosthetics & Orthotics is dedicated to helping people with limb loss in central and Eastern North Carolina live life without limitations. We're known for our craftsmanship of specialty prostheses and customer service ensuring each patient gets the most from their device. We have locations in Raleigh, Wilson or Jacksonville, or you can contact us via email for more information.